A black bear, estimated to be between 300 and 400 pounds, was spotted outside of the Traverse City Fire Department along Front Street on Sunday morning. 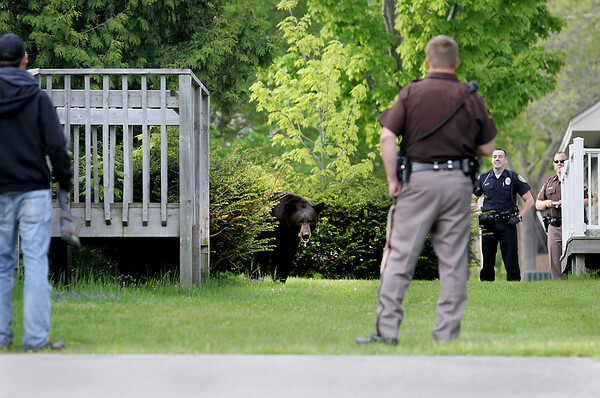 It eventually ran up a tree close to a home near the intersection of 12th and Oak streets, where it was brought down using tranquilizers and placed into a bear trap. It is expected to be released onto state land. A black bear looks out as members of area law enforcement, area fire fighters and state natural resources officers stand Sunday, May 29, 2011 between two buildings located near Second Street and Division Street.